Way to go Trek, send us a press release talking up new bikes and new technology and include one photo of a bike everybody has already seen. Awesome. Can you feel my bitterness? Anyhow if you want to read about the new Session, the 160 mm travel Slash and the new DCRV fork then read on. If you want to look at pictures you could go to Pinkbike for the Session or over here to BikeRumor to look at the fork. Can't find any Slash shots just yet... actually Scratch that (get it? Trek has a model called... nevermind). Nick found a photo here. (Mayrhofen, Austria) – The world leader in mountain bike technology, Trek Bicycle, has unveiled its 2012 collection of trail-ripping full suspension bikes to the global media at its Ride Camp in Mayrhofen, Austria. Included in this year’s line are two completely new models; the DH-world changing OCLV Mountain Carbon Session 9.9 and a bike that’s fitting of an entirely new category called “Technical Trail”, the new Trek Slash. New technologies abound as Trek’s Fuel EX, Remedy, and Rumblefish bikes will now be equipped with DRCV Fox Forks, a new fork breakthrough spawned from Trek’s Southern California-based suspension lab’s development work with Fox Racing Shox. DRCV FORK Trek’s singletrack and technical trail platforms get a huge suspension technology boost with the addition of Fox DRCV forks (Dual Rate Control Valve). The Dual Rate Control Valve rear shock that has been so well received on the Remedy, Fuel EX, and Rumblefish platforms is now being paired with a fork that incorporates the same technology and matches its performance. When the fork is compressed far enough into the stroke of the primary air chamber, a plunger opens a second air chamber, increasing the volume of the shock for larger impacts. The result is small bump compliance, with big-hit performance. This technology, developed by Trek’s Southern California-based suspension laboratory and Fox Racing Shox, sets a new standard for suspension performance unseen anywhere else in the bike industry. “After we made so much progress in increasing rider control with the DRCV shock, it’s great to be able to bring that versatility and improved handling to the front suspension,” said Trek Suspension Lab Director Jose Gonzales. 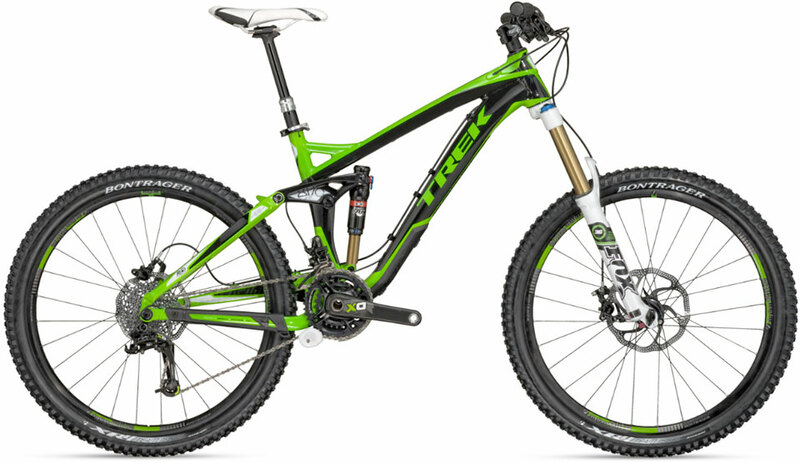 “It further isolates the rider from the bumps of the trail and keeps the wheel on the ground longer, meaning better traction and greater stability.” With the new fork design, Trek has also slackened the headtube angles on the EX and Remedy by one degree, increasing the bikes’ stability at higher speeds, and improving handling in steeper sections of trail. To top off the new look of the EX and Remedy lines, Trek moved cable and brake hose routing internally, which not only creates a cleaner bike, but also makes for a quieter ride. EXPANDED 29ER COLLECTION From the godfather of 29” wheels, Gary Fisher, comes an expansion to the world’s broadest, and best-selling, collection of 29ers. 2012 welcomes aluminum versions of the insanely popular, 100mm-travel, Superfly line that will be offered alongside their established carbon brethren. The singletrack trail slayer Rumblefish gets a new mainframe with a higher bottom bracket and a full 120mm of rear wheel travel. Rumblefish will also be getting a huge fork upgrade with the addition of the new DRCV fork, making it one of the most capable 29ers when the trail gets rough. SUSPENSION CALCULATOR For 2012, we’ve addressed the rider and their experience as much as the product by making a perfectly tuned ride possible anywhere Wi-Fi is available with the launch of an online calculator that provides the perfect suspension settings throughout the full suspension line given a rider’s bike, model year, and weight. Optimized for mobile, tablet, and desktop devices and accessible now at trekbikes.com/suspension, the suspension calculator features an intuitive interface that will provide the perfect suspension settings throughout Trek’s full suspension mountain bike collection. The calculator will be updated with new models throughout the year as 2012 bikes arrive at Trek retailers.